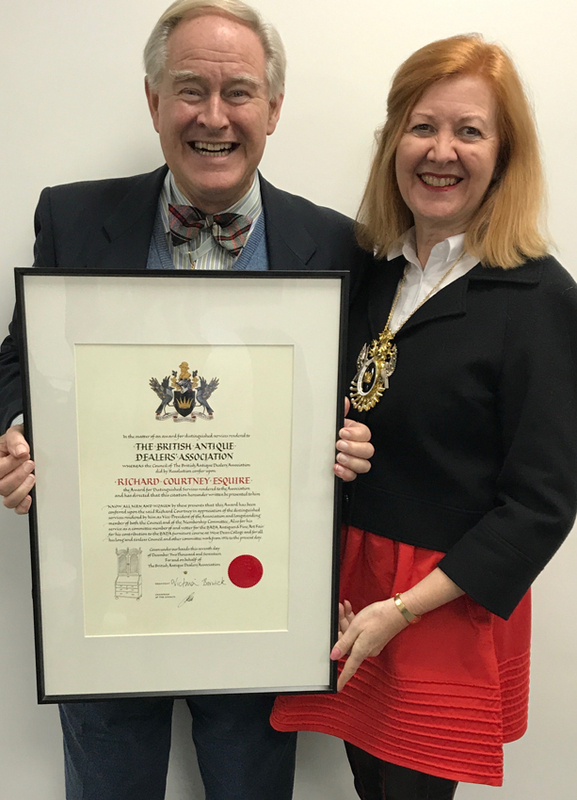 West Sussex furniture dealer Richard Courtney has been awarded a distinguished service medal by the British Antiques Dealers’ Association. Dealer Richard Courtney receiving his award from the British Antiques Dealers’ Association president Victoria Borwick. The English furniture specialist founded his business in 1966 and became a member of the BADA the year after. His first showroom was on Fulham Road, where he stayed for nearly 40 years before moving to Kensington Church Street in 2005. He now trades from West Sussex by appointment only. Courtney has served on the BADA council for more than 40 years, including two years as vice president. He received his award at the BADA’s AGM last week.